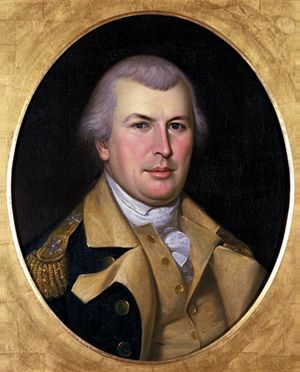 Nathanael Greene (August 7, 1742-June 19, 1786) was a general in the Continental Army during the American Revolution. He was from Rhode Island and was a Quaker. Before the war, he was a blacksmith and a delegate to the Rhode Island General Assembly. During the war, he commanded a fort in Boston and a part of Washington's army during the New York, New Jersey and Philadelphia campaigns. Late in the war, Greene commanded an army in the South. After the war, he moved to Georgia, where he died of sunstroke. The Council of War letter (this copy made contemporaneously with original) that Greene sent of the proceedings to Samuel Huntington, the president of Congress. Written at Guilford Court House on February 9. 1781. This is a scan of the photograph from the National Archives. Nathanael Greene Facts for Kids. Kiddle Encyclopedia.